How have two weeks of December gone by already? 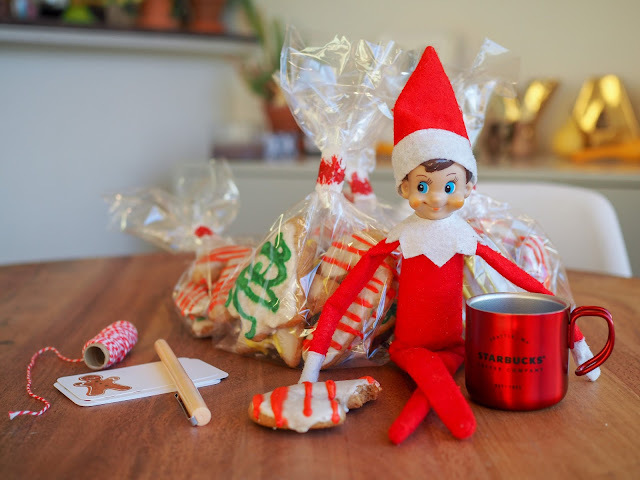 I have no idea where they've gone, but they have gone and that means it's time to share another installment of Elfie Pokie Nokie's adventures in our home. Elfie got into the girls' Magnatiles and built himself some sort of crazy house. Or is it a car? It does have wheels. Maybe it's a motor home. Either way, it doesn't look like a particularly comfortable ride. 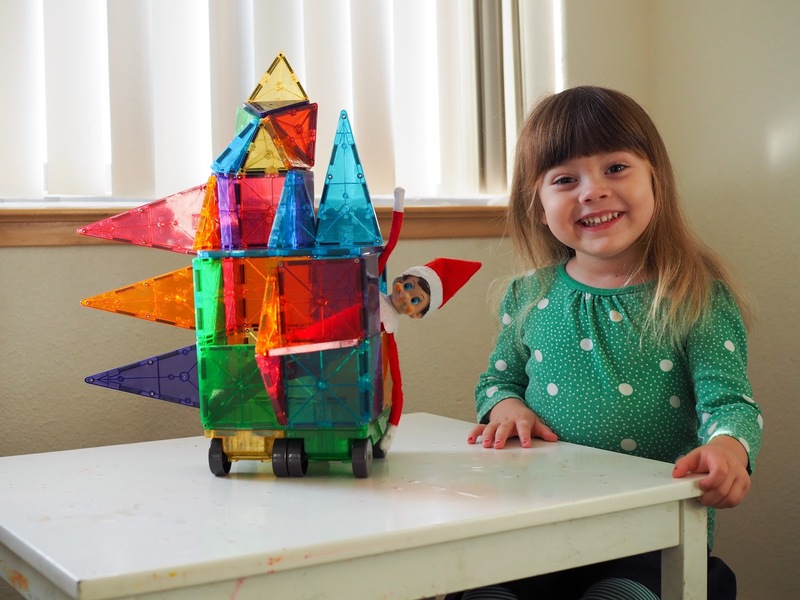 Mathilde was pretty impressed with it, but she couldn't wait for Elfie to get out so she could play with the Magnatiles too. We picked up our Christmas tree from a local tree lot the day before but hadn't had a chance to decorate it. 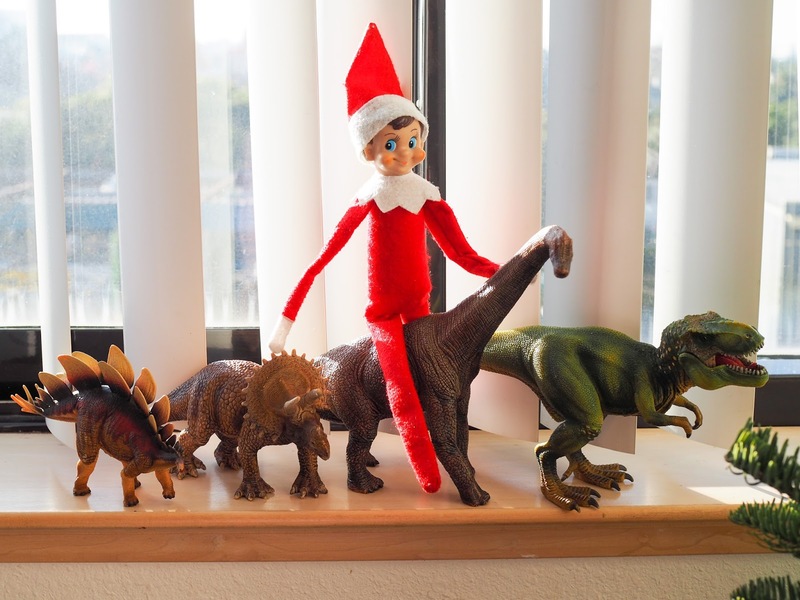 Elfie took it upon himself to decorate it - with Mathilde's dinosaurs! The girls quite liked the dinosaur covered tree but they couldn't wait to decorate it with real Christmas ornaments. 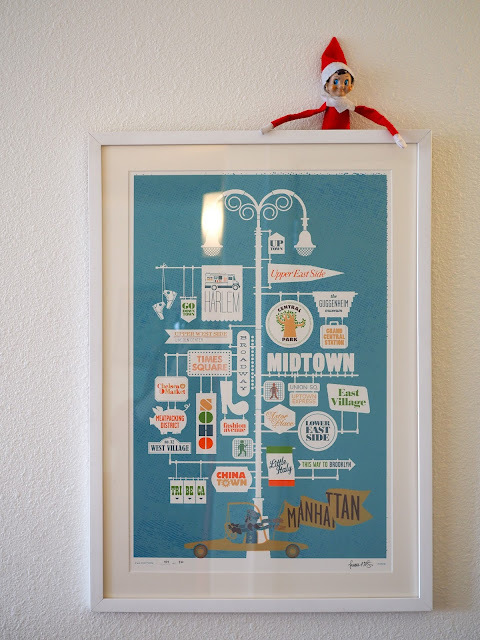 It took the girls a little while to spot Elfie this morning. I guess he blends is better than it looks! Or maybe they just didn't think to look up! 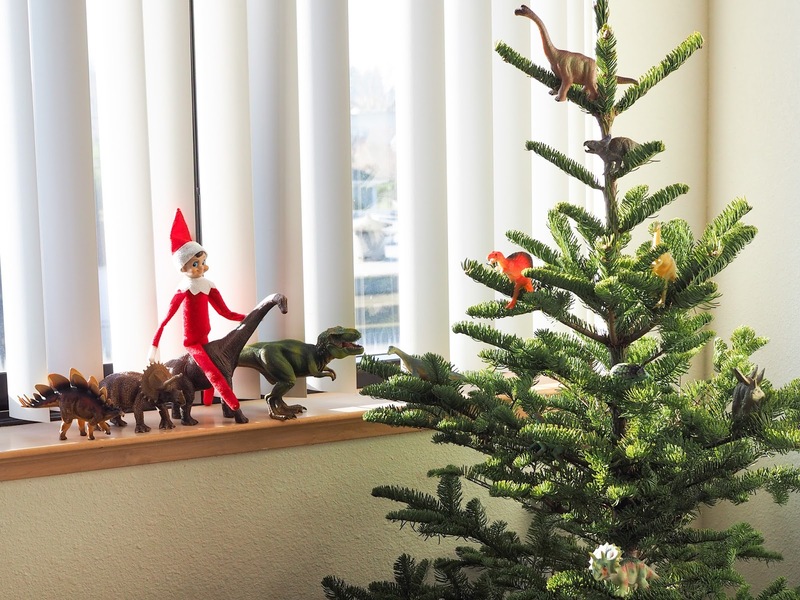 By now our Christmas tree was nicely decorated with real ornaments rather than dinosaurs. 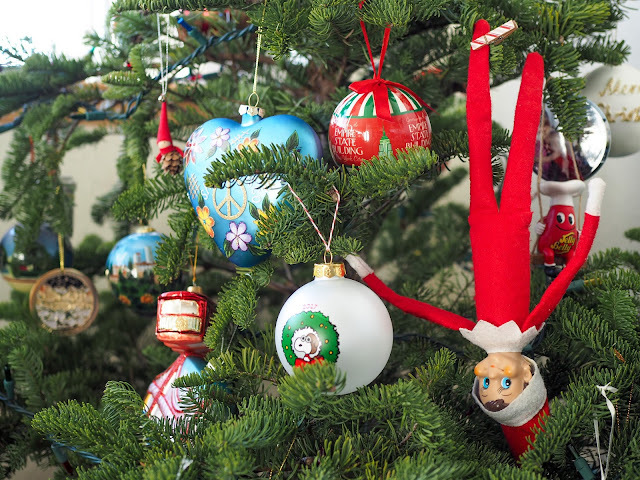 One such "ornament" did look a little out of place though. Wait a minute, that's Elfie pegged to the tree by his foot! 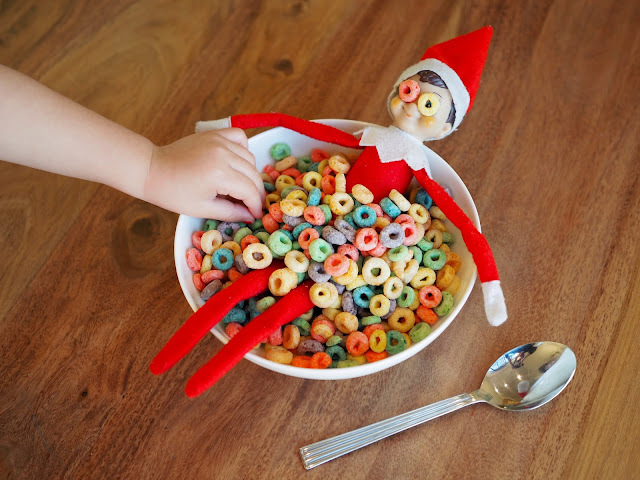 Just like when we found Elfie hanging upside down on the fridge, there's a Jelly Belly jelly bean nearby looking just a little suspicious. I'd watch out for that jelly bean if I were you Elfie! When we shop at Trader Joe's (which is generally several times a day seeing as it's just downstairs) the girls are usually given stickers by the staff. They also get lollipops when they find the Oski Bear hidden in the store. Mathilde and I went on a late night shopping trip and left everything, including her stickers and lollipop in the kicthen. 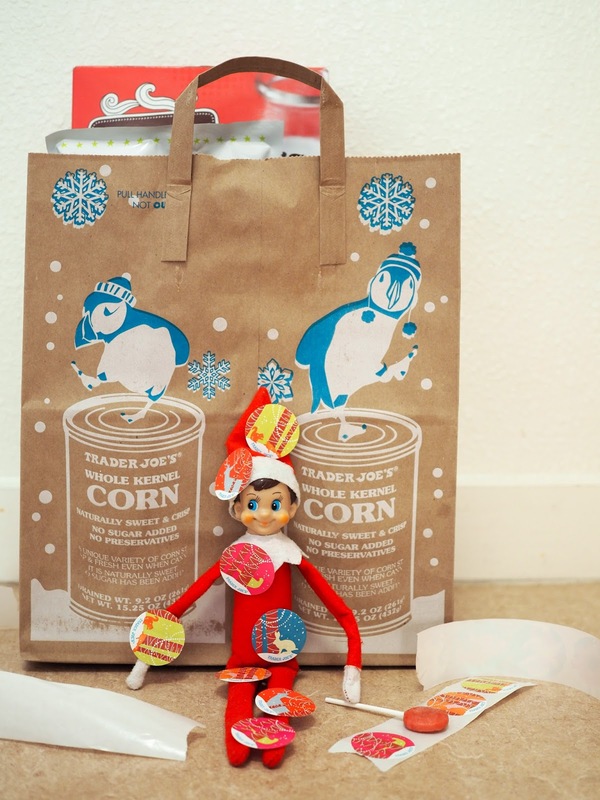 Looks like Elfie wanted in on the Trader Joe's fun too! 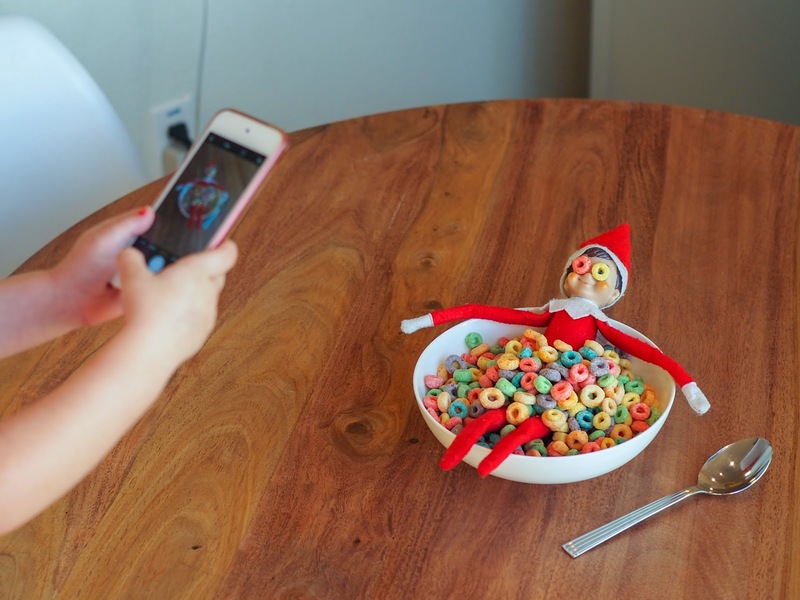 Lots more Elfie Pokie Nokie fun to come! I'd love to hear what your elf has been getting up to.